No matter what kind of garage door you may own, it's essential to perform yearly inspections to maintain moving parts in good working condition. From sensor testing and alignment to regular lubrication of the moving components, you'll need the services of a professional team to make sure the door works as it should no matter how old it is. We take care of all your garage door maintenance needs, so you can be confident that your door is in tip-top condition at all times. Sensors are some of the most sensitive parts of a garage door, and it's essential to have them tested and properly aligned on a regular basis. We'll make sure your sensors are working well and adjust them accordingly if something is amiss so you can enjoy your garage door just like you did when it was completely new. Lubrication keeps moving mechanisms in good condition and allows them to perform at their best capacity. The hinges and rollers that allow your door to bend and move quickly require oiling at least once or twice a year. We only use the best lubricants to make sure your door gets the proper treatment. 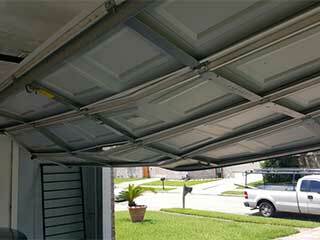 When the springs of your garage door require adjustments, we are there to help. With our extensive stock of quality tools, we have everything needed to adjust the springs and make them work just like they did on their first day. We can also check the cables and locks at the same time and have them functioning perfectly in no time. Make an appointment today and we'll be there to see what kind of maintenance your door needs and fix everything that may be wrong quickly!